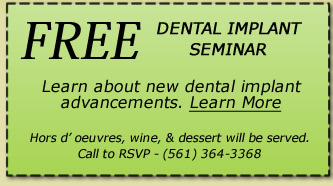 Are you tired of food collecting under your dentures? Do your dentures cause mouth sores and move or click when you talk? There is a modern solution to removable dentures. Dr. Broggi can give you replacement teeth with implant-supported dentures. These dentures will look and feel natural. Schedule a consultation at Dr. Broggi’s Boynton Beach dental implant center, and he will determine whether you should have traditional dental implants or mini dental implants. What’s the Problem with Dentures? Dentures by themselves do not function like natural teeth. 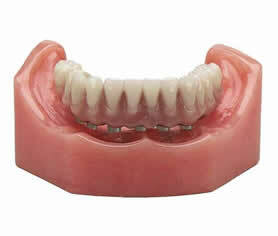 The average denture wearer only wears the upper denture 60% of the time and the lower denture 20% of the time. Many do not wear them at all, because dentures are unstable and lack retention. We call the lower denture a “floater,” because it floats in the mouth, rather than being securely anchored in place. For this reason, denture wearers cannot eat the same quality of foods that they enjoyed with natural teeth. This often results in poor nutrition and poor digestion, which can lead to poor health. In addition, the underlying bone that you rely upon to keep your dentures in place continues to dissolve because the denture does not stimulate the bone like natural teeth. Dentures actually cause the bone to atrophy. The more bone you lose over time, the worse your denture will fit. The good news is that by retaining your dentures with dental implants, you can solve these problems. 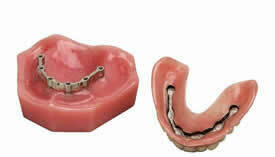 There are two types of implant retained dentures: Removable Over-dentures and Non-Removable Fixed Dentures. 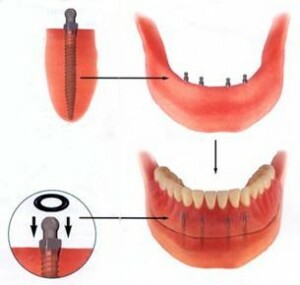 Removable Over-dentures are traditional dentures that are anchored in the mouth by fitting directly over conventional or mini implants or over a bar connected to the conventional implants. Because they fit over the implants we call them over-dentures. These dentures are removable and have to be taken out after meals and at night and morning for cleaning. You treat these dentures like regular dentures. Non-Removable Fixed Dentures are the next option. These dentures are also called hybrid dentures or fixed detachable dentures. The dentures can be made of regular strength. These dentures stay in the mouth all the time. You treat them like natural teeth. Brush and floss them daily. These types of implant-retained dentures are anchored by five or more dental implants per jaw. The Non-Removable Fixed Denture replacement teeth are classified as permanent (not removable) though the dentist can take them out if necessary without damaging the underlying implants. A fixed detachable gives the patient the best function next to natural teeth. 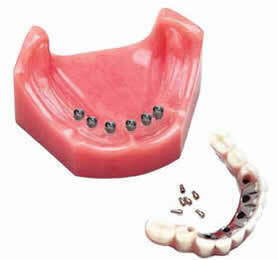 The Non-Removable Fixed Dentures are the strongest between the two types of implant-retained dentures. Recent studies have shown that implant-supported dentures increase biting forces up to 10X within the first year and can increase biting forces up to 300X over the next 3 to 5 years. Imagine what it’s like to chew, speak, and smile with ease again. Implants are the single best thing that has ever happened in dentistry for the denture wearer. Removable implant dentures are typically used when the Non-Removable Fixed Denture cannot be, either due to limited bone or due to budget constraints. When there is minimal bone, Mini dental implants can also be used to retain the denture. Dr. Broggi will carefully examine your oral status, bone density, and medical history to determine whether full or mini dental implants would be best for you. Mini dental implants (MDI) are toothpick-thin titanium posts that secure a lower denture. Unlike traditional implant surgery, MDI surgery is minimally invasive. The entire process, including denture stabilization, can be completed in a matter of hours. Imagine coming in for your mini dental implant appointment and leaving that same day with a full set of perfectly secured teeth. You can even enjoy lunch with a friend following implant placement. Mini dental implants are perfect for patients who don’t have enough bone for full implants or who have medical constraints that prevent surgery.